Subject:— Appeal of Department of Ex-Servicemen Welfare to donate minimum Rs. 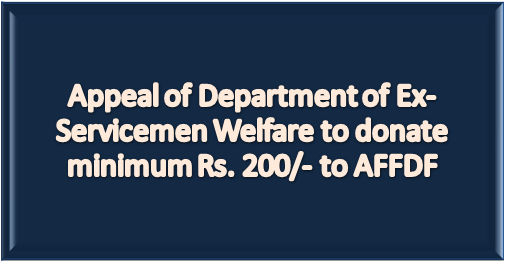 200/- to Armed Forces Flag Day Fund (AFFDF). The undersigned is directed to forward herewith a copy of the O.M. No. 7(8)/2017/D (Res. II) dated 4th October, 2017 the contents of which are self- explanatory. 2. It is requested that the appeal made by Department of Ex-Servicemen Welfare may please be brought to the notice of the respective DDOs' and of all the employees working in all the Attached/Subordinate offices of your Ministry/Department as well as the principal offices for necessary action. 1. Shri Santosh, Joint Secretary, M/o Defence, D/o Ex-Servicemen Welfare, Room No. 237, 93'Wing, Sena Bhawan, New Delhi-110011. 2. NIC, DoPT with the request to upload this O.M. alongwith the enclosures on DoPT's website. The Department of Ex-Servicemen Welfare, Ministry of Defence has been working for the welfare and rehabilitation of war widows, wards of martyred soldiers and ESM including disabled by providing financial assistance for their identified personal needs such as penury grant, children's education grant, funeral grant, medical grant and orphan/disabled children grant. This financial assistance is provided out of the Armed Forces Flag Day Fund (AFFDF) for which contributions are received from the general public on the Armed Forces Flag Day (AFFD) which is celebrated on 7th December every year. Efforts are required to increase the contribution to the Armed Forces Flag Day Fund to meet the increasing requirement of financial assistance for our ex-servicemen, their wards and war-widows. All citizens of India are requested to take the opportunity on this Flag Day on 7th December, to connect with the cause of war-widows, ESM, wards of the martyred soldiers and contribute generously to AFFDF in solidarity with our soldiers and their NoKs/dependents. Contributions to AFFDF are exempt from Income Tax under Section 80G(5)(vi) of the Income Tax Act,1961. Payments may be made to KSB Sectt. by A/c Payee Cheque/DD drawn in favour of the Armed Forces Flag Day Fund A/c' payable at New Delhi or deposited directly in the Savings Bank A/c No.3083000100179875 maintained at the Punjab National Bank at R.K. Puram, New Delhi (IFSC Code-PUNB0308300) or online at www.ksb.gov.in.